Touring the awe-inspiring Iguazu Falls, on the borders of Brazil and Argentina on the Iguazu river, is best done in at least two days. Here are some places to stay on either the Brazilian or Argentine side of the falls. 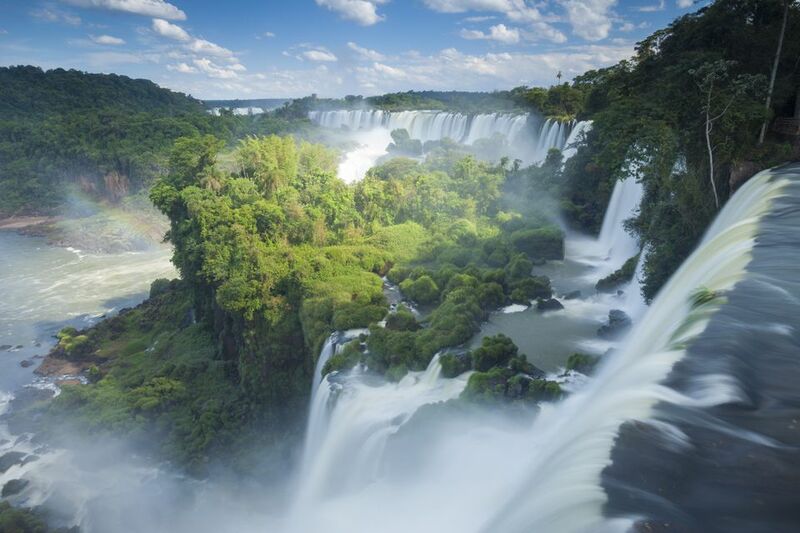 Please make your reservations well in advance as Iguazu is rapidly becoming a popular destination in South America. The Melia Iguazu Hotel (Formerly The Sheraton) is situated in the heart of the Iguazu National Park on the Argentine side and within walking distance of the spectacular Iguazu waterfalls facing Devil's Throat. Mabu Thermas and Resort is located on the Guarani Aquifer, the world's largest underground water reservoir. In addition to the splendid access to the falls on the Brazilian side, the resort offers facilities for adults and children in specially themed special packages throughout the year. In addition to the golf course, this Brazilian resort offers pools, tennis, restaurants, business traveler services and babysitting, as well as non-smoking and handicapped facilities. For those looking for luxury, consider the outdoor Jacuzzi sauna and steam room or the outdoor pool with a waterfall. 120 rooms furnished with all comforts and good taste. The Cataratas restaurant and snack bar serve the most delicious international cuisine. Cataratas Hotel also makes arrangements for events and conventions. 15 minutes away from the falls on the Argentina side. Other than The Melia Iguazu Hotel, this is the only opportunity to stay somewhere facing the falls—in this case,​ Iguaçu National Park. Only a quarter mile from the national park in Brazil, this resort gets good reviews from travelers who enjoy the proximity to the airport and the aviary. It's often praised for its old-world elegance although rooms tend to be on the smaller side. Perhaps the most popular luxury hotel on the Argentine side of the falls, with all the modern amenities you would expect from wifi to a pool and spa. Guests wanting to gamble will find plenty to amuse them at the casino.